Search Engine Guide > Mike Moran > Are You Optimizing for Search Engines or for Customers? The very name "Search Engine Optimization" would seem to answer the question of who marketers are optimizing their site for. All the great advice you get about getting your pages indexed and finding which keywords are used in the search engines and optimizing your content to be found by the search engines--it's all search engines all the time. Or is it? At some point, you need to ask yourself why you are doing all of this. Don't get me wrong. I agree with all the advice about how to make your site appeal to search engines--I have written about it for years in blogs and books and magazine articles and anywhere else someone will read what I have to say. So, I'm not telling you to forget all that advice. I'm telling you that there is more that you need to do. Too often, we treat our Web sites as though they exist as an end in themselves. The pages are there, the messages are there, the content is there--search marketing is about taking what's there and making it "search-friendly." But that's not all there is. Perhaps the most important part of search marketing is understanding the content that your customers really are looking for and providing it. It's very likely that your customers are looking for information that isn't on your site at all--optimized or not. Think about your own business. How many customers out there have no idea what you do? Or why they'd ever need you? Suppose you are an estate planner. Do you think that your customers know when they need an estate planner? You might say yes, with your evidence being that the searchers who find your Web site consistently enter "estate planner long island" or "estate planner nassau county"--but what were they looking for before they knew to type those words? How many of your potential customers were looking for words like "elder care trust" or "medicaid asset protection"? Probably a lot of them. Every one of your competitors is fighting over "estate planner long island" and you should continue to wage the good fight, too. But if you branch out a bit, and try for "new york elder care trust" by providing strong information to help with that specific problem, you might capture a searcher before they start searching for "long island estate planner." Most businesses can benefit from similar advice. Don't be satisfied with doing what all your competitors do. Optimizing your site for the same words that everyone else does can't possibly work for everyone. Differentiate yourself from the pack by thinking more broadly about what your customers need. When you stop merely optimizing the content you have for search engines, and you start optimizing your content and messaging to what your customers really need, you'll see a big increase in what you are really looking for: your bottom line. Great Article! I agree with you that there is a fine line what you do for search engines and what you do for customers and I hope more business understand how big search can be and what they can do with it versus just going after 5 - 10 keywords that everybody else does. Thank you for once someone had the bright idea to say wat was needed about SEO. After all its our customers search engines are egging to please not their own ego. Google would think I am relevant only if my end user thinks so too...and here we have all and sundry just looking for opportunities to please the search engines....ah alas you have spoken Mike. Thanks, Luci. You are right that sometimes this advice results in going after long tail keywords, but I would argue that sometimes the keywords you need to shoot at are even more popular than the ones you are currently going after.For example, "estate planner nassau county" is probably less popular than "new york medicaid asset eligibility" but people might be searching for information about the assets before they even know they need estate planning. It's more about thinking about where your customers are coming from before they get to the point of knowing how to ask for you. Thanks again for your comment, Luci. Search engines sometimes, its an easy trap to slip into. I guess it's all about balance. You want to get the SE traffic but you want repeat visitors as well. Balancing between new visitors and retaining your loyal visitors. Very Great Article. I agree with you. 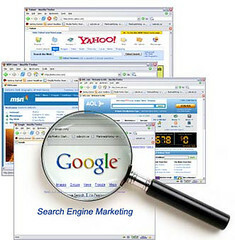 More people not understand how big search engine can be and can make more visitor come. I agree it's all about a balance between content that is appealing to both Search Engines and customers alike. Search Engines may drive traffic to websites but well written content will keep them there. Remember, SEO is not about traffic, it's about conversion.